ClarenceThere was a time when every farmhouse in the country kept a couple of pigs. Even now when you look at any old farmstead there will still be evidence of the pig sty. Pigs were kept for their meat but were also a great way of disposing of any waste. There was a slop bucket kept by the kitchen door for any food waste. If there was any wastage from the fields that was fed to the pigs as well! There was no real cost to keeping the pig and in the end you had bacon and ham for Christmas. 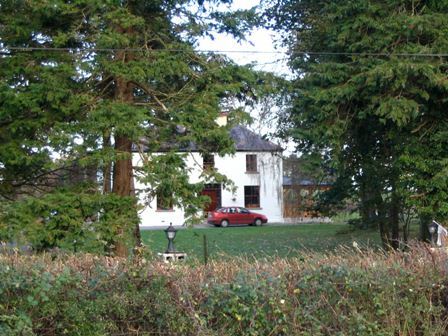 I remember visiting my Granny’s house on the edge of Roscrea town. Many of the neighbours kept pigs in their suburban gardens and all the neighbours saved their household slops to feed the pigs and got a nice piece of bacon in return. This was “true community farming”. Why did this tradition stop? It stopped because it was perceived as being a “poor” thing to do. If you kept pigs and cured your own bacon you obviously could not afford to buy it. Such a concept seems so strange to us today, when we all love the idea of rearing our own meat. As Ireland got wealthier many people moved away from the rural farming areas to a more urbanized lifestyle in the cities. The pork and bacon industry turned into a much more concentrated process. What goes into the animals feed is enough to terrify any normal soul. Pigs don’t do ‘sick’, they are either healthy or dead. To minimize loss of animals, the pigs in most farms are feed a diet that includes antibiotics – just in case they should get some illness! Where do all these antibiotics end up? In the meat, of course! When the meat is eventually processed it is extremely tasteless, anemic looking and fat free. At that point it does not even come close to resembling real pork There are all sorts of arguments about how this type of intensive farming is not ‘bad’ for the animals. However, it’s not natural. Pigs are natural rooters and foragers. To be enclosed in slatted, concrete barns is just plain wrong. Sows are confined to farrowing pens where they cannot sit or turn around – that is not natural. ere is good news for Irish pigs - well, for some pigs anyway. There is a tide change here in Ireland. 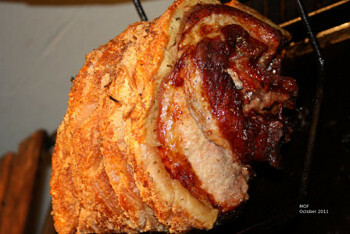 More people are looking for pork raised in the traditional way. Free range pig breeding is on the rise. In a free range system pigs have access to the outdoors 24 hours a day, seven days a week. Pigs are very clever animals. If it is cold and miserable outside they will stay tucked up in a nice bed of straw and only venture outdoors when necessary. Since we started keeping pigs almost 5 years ago, we have met many people who are doing the same. Not a month goes by without an enquiry to buy some piglets. Some folks are just keeping a couple of pigs for themselves. 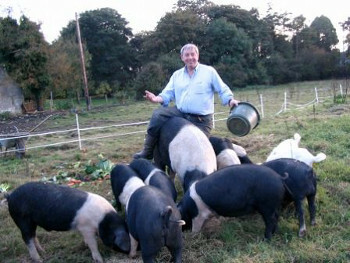 Others like us are trying to build a business selling free range pork products. Free range farming is a very different process from the intensive, profit driven factory system. 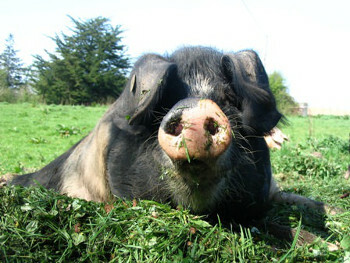 Our pigs are born here on our farm, at Oldfarm, Redwood, Lorrha, Nenagh, Co. Tipperary. They usually venture outdoors within 48 hours of their birth. It will only be a few steps outside the sty door before they scamper back inside to the cosy warmth of straw. The mothers all give birth naturally with no interference from us other than a watchful eye. No farrowing stalls are used. In the five years we have been in business we have never lost a baby pig due to the mother lying on it. It is a most amazing thing to listen to Mother Pig ‘talk’ to her babies. She makes one particular noise to let them know she is going to lie down to feed them, then another happy grunting sound as she suckles. Within a short time the piglets start to nibble on feed. We feed our pigs a mixture of gmo free barley and wheat which is supplemented with vegetables from a local market gardener as well as whey and cheese from an organic farm. Over time every pig we’ve ever had has developed a preference for something or other. Perky is very partial to potatoes. All the pigs love cheese and apples. Clarence loved bananas. Socky loved celery, and for Pinky it was oranges! You just never can tell! The difference between meat from pigs reared in a natural environment and those from factory farms is spectacular. Thankfully, there are a growing number of people who appreciate our efforts. There are still challenges facing us. 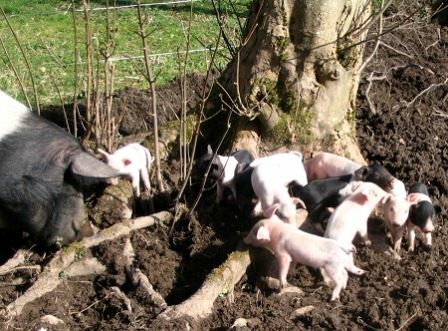 Land: Extra land would be nice - but not everyone wants to lease land for pig rearing - they do a good job of clearing out weeds and roots but not everyone appreciates that, and also agricultural land is so so expensive. Meal: costs fluctuate - depending on the crop and harvest. Also we are adamant about non-GMO [genetically modified organisms] and sourcing meal that has been grown in a completely non-gmo way is important to us, and could become more difficult! Fuel charges - which of course adds to the delivery charge. It would be nice if there was some sort of distribution system for small producers. Education: a lot of our time is spent on educating consumers about our product - clean meat, no gmos (which an awful lot of people still know nothing about - so therefore they don’t even consider that factor). Labeling: there is an ongoing battle of the labels; artisan, organic, outdoor reared, free range, gmo free. The term “Artisan” is used to such an extreme that it has become difficult to define. 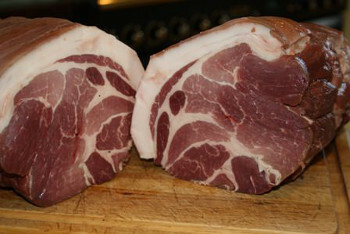 We are aware of large companies, using factory reared pigs, and selling their products under the ‘artisan’ label. Yet we fit the true meaning of the category. We have chosen not to go the labeled ‘organic’ route as the costs would be prohibitive. We are a small holding and can only produce so much meat. The cost of being labeled organic would price our product out of the market. We are working with Bord Bia (the Irish Food Board) in the hope of developing a recognised free-range label. It is a slow process with so many interested parties having to be consulted. Taking these steps will hopefully give tomorrow’s consumer a better understanding of how we rear and treat our animals. Alfie and PigsWe are also talking to some other food producers in our neighbourhood in an effort to develop a shared delivery system.